What if all of your source data applications—from ERP and CRM to warehouse management and supply chain—could publish information automatically in real time, every time changes occurred? What if all of that information could be translated into business insights and delivered through a common interface, accessible anytime, from anywhere? Infor d/EPM is the single, integrated platform for managing business performance, delivering business insights, and managing risk. Infor d/EPM combines all the capabilities of an enterprise performance management suite with the power of a comprehensive business intelligence suite. It is financial performance management, business intelligence, and a continuous controls monitoring/risk management solution all on the same platform. You get an integrated suite of applications that operates across the complex web of your enterprise systems to deliver a near real-time, single version of the truth. Financial Performance Management – Get a single application for all your budgeting, planning, and forecasting needs; operationalize your planning; and seamlessly consolidate multiple sets of books. 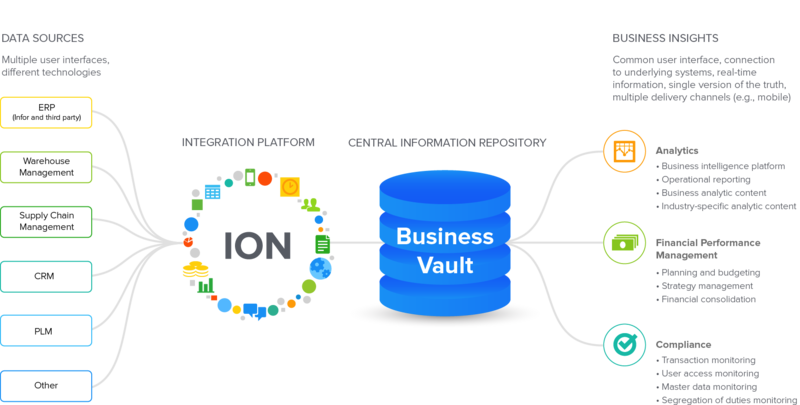 Analytics – Centralize your data, easily integrate with your business applications, and deliver business insights through a variety of channels. Compliance – Proactively monitor your systems for transaction anomalies and score risks to quickly understand their potential impact. Infor d/EPM collects real-time data from your source applications and translates it into business insights delivered through a fully integrated solution suite with a common user interface. Every time you make a change, from modifying an order to changing an inventory status, information is updated automatically. You get a real-time, single version of the truth from a suite that is pre-built to take advantage of innovative technologies like mobility, big-data, and in-memory computing. What makes Infor d/EPM different? Infor d/EPM layers world-class business intelligence, financial consolidations, and business performance management capabilities onto Infor's technology platform to deliver simplified integration, beautiful design, and in-context business intelligence. See all your data, from your Infor or non-Infor systems in one place, regardless of the source. Access data, plans, and insights anytime, from anywhere, on your desktop, laptop, tablet, or smartphone. Forecast and project on the fly, wherever you are; adjust plans easily to accommodate changing business conditions; and view your business' performance anytime, anywhere. See your budgets and strategic plans in the same window as your ERP transactions, so you can understand the impact of a change before you act.